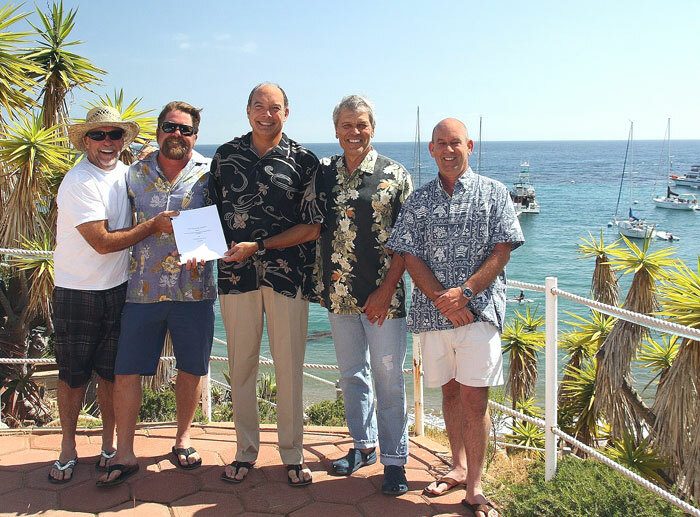 TWO HARBORS — The Santa Catalina Island Co. (SCICo) announced it has signed a long-term lease agreement with Corsair Yacht Club and Blue Water Cruising Club for their continued use of Emerald Bay and Big Geiger Coves on the island. The agreements will allow the clubs the continued use of the two private coves located near Two Harbors. Additionally, the lease agreement secures Corsair YC’s use of facilities on Emerald Bay and Blue Water Cruising Club’s use of Big Geiger Cove. Both agreements have been signed in coordination with both clubs’ 50th anniversaries of hosting activities on the island. Established in 1937, Corsair YC hosts official club cruises at Emerald Bay at least nine times a year, in addition to an annual sailing race at Catalina Island. Based out of Emerald Bay at the West End of Catalina Island, the yacht club hosts cruises to other Catalina coves, the mainland and monthly dinner meetings in Long Beach. The club’s 75 members are active in fishing, diving, hiking, kayaking, navigation and other water-based recreation. Blue Water Cruising Club, a nonprofit organization founded in 1945, has leased the shore facilities at Big Geiger Cove since 1953. The club maintains the cove facilities for its members and their families. Limited to 55 boats, the cruising club ensures equal access to the cove and the facilities, even during the busiest summer weekends.